wednesday – Brendan Mancilla, Author. I don’t think I’ve ever ever despised something with as much vitriol as i utterly hate running. Looking back, though, I can’t help but think that this was bound to happen. As soon as I started going back to the gym regularly I got to thinking—you know, that other thing I do besides sweating while I’m on a freaking treadmill—and I asked myself, how many miles have I actually run? How many combined calories is that? Am I getting better or worse at this monstrous, abominable activity? And there are times when, despite my affinity for technology, I’m not particularly intelligent about it. I discovered this week that Nike+ has a running app for the iPhone that stands alone and doesn’t require a shoe sensor. I was surprised and delighted because I hate spending money and, accordingly, love free things! I loaded up the app and went for a run on Wednesday, which was agony because I’m awful at running outdoors and horrifyingly out of shape, but it was really really cool to see my route and assorted information. One of the more courageous features of the app is that it invites you to set challenges for yourself, and to invite others to participate in those challenges with you. I set a semi-realistic goal of 50 miles by the end of August. I see it like this: I already go to the gym 3 times a week and run, on average, 2.4 miles on each visit, so my ability to output miles is there. I need to complete, on average, 1.6 miles a day or 3.3 across 15. I honestly think I can accomplish that, so I set it as my goal. That being said, I’m not just blindly charging into this one. Runners World has a great 8 week training guide that I’ve been working with to build endurance (and no, I’m not remotely interested in running an actual marathon), but the sore spot in the real world is that I need a good way of tracking my time without glancing at my watch/phone. That’s my number one complaint with the Nike+ app: it doesn’t allow you to set interval timers for those of us who need to build that endurance. 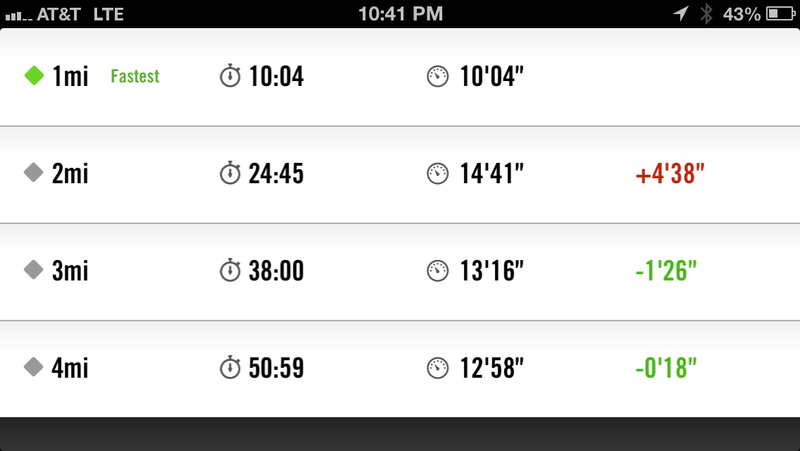 I downloaded IntervalTimer to compliment the Nike+ app; I plan to put it to use for the first time tomorrow. I’m going to revisit my original route by Lake Hodges, where I posted an abysmal 12’57” average (though my best was 10:04 mile, which is only a smidgen more than 9’50” mile from early July) and see if I can’t make some modest improvements. 50 Miles seems within reach, all things considered. I have 4 down, 46 to go. I’m all decked out and ready to run—if begrudgingly. If you have Nike+ and want to add me as a friend or just want to keep tabs on my progress, feel free to visit my Nike+ page. Otherwise, check back here throughout the month for periodic reports on my status. Here’s to a challenging month!